It was a glorious last supper. The menu for the final meal for first class passengers on board the liner Titanic is a feast for the eyes. Little did the diners dream as they sailed along on the calm waters of 14 April 1912 of the nightmare that lay ahead. They feasted on a menu of up to 13 courses - they would have been at table enjoying the luxury of silver service for between four and five hours - what else was there to do at sea? From foie gras pate to champagne to asparagus and watercress salad and rose water and mint sorbet - the finest of food was theirs. The ship was on its maiden voyage. Shortly before midnight it would strike an iceberg and sink, resulting in the deaths of 1,517 of the 2,223 passengers on board. Now, a chef from Northern Ireland who trained in the Black Forest and New York, is offering visitors to his Holywood restaurant the chance to try the last, first class menu on the Titanic for themselves. Conor McClelland is the proprietor and chef at Rayanne House in Holywood. His guesthouse looks out over Belfast Lough. The people who lived at his home on the day the Titanic was launched from Belfast's Harland & Wolff shipyard were no doubt up on the balcony watching the great ship sail majestically out to sea. When Conor came upon a book of old Titanic recipes, he began a culinary journey into the past that led him to recreate the last meal on board the Titanic. "There are nine courses in all," he said. 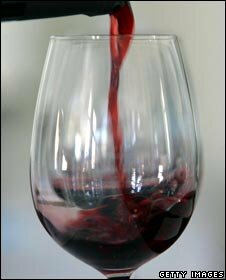 "In the original, there could have been 13 courses but nine courses is really more than enough. "At that time, they would have served pates and terrines at the end of the meal just before desserts. But today, that would seem very strange." Instead, the chef settled for a menu which starts with canapes a l'amiral before moving on to cream of barley soup flavoured with Bushmills whiskey. "There were cases of Bushmills on board the Titanic of course," he said. Diners then cruise into salmon and pan seared filet mignon before feasting on spiced peaches. 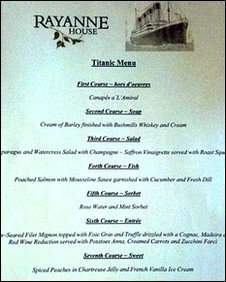 Conor, who runs the guesthouse with his wife Bernie, said the interest in the Titanic menu had been "phenomenal". "The food is genuinely lovely. It was such a beautiful menu. There was so much attention to detail in the food that it really was a first-class feast." The husband and wife team first became interested in the Titanic when they came across a G W Carey painting of the Titanic which could have been created from their back garden. "It was a watercolour and it was clearly painted from just beside our guesthouse," said Conor. "Then we found a painting of our house by the same artist. Offering the menu for our private diners seemed like a nice touch." The Titanic menu is just one of the ways in which Belfast is celebrating the great liner and its links to the city. The Titanic Made in Belfast Festival runs until Sunday 11 April 2010. Visitors can enjoy walking tours, ghost boat tours, bus tours and exhibitions... as well as a feast to remember.